An annual Taiwanese festival celebrating the start of the New Year lights up Adam Gibson’s life. Toni Basil’s 1980s hit song ‘Mickey’ blares out across a chilly night sky, and thousands of people crammed into the arena are treated to a pom-pom–shaking display by girls dressed as American cheerleaders and backed by two dozen performers wearing what may (or may not) be oversized Pokemon costumes. Welcome to the resolutely kitsch high point of the annual Taiwan Lantern Festival, an event where ancient eastern custom meets modern Asia in a collision of traditions and a mash-up of religion and technology. Oh, and there are lots and lots of lanterns. In a world where many countries seem basically the same, Taiwan’s idiosyncratic touches and eccentric quirks make for a refreshing change. A 36,000 square kilometre country of super-fast trains and even faster drivers, of red-toothed betel-nut chewers and passionate-yet-confusing politics, its island status extends beyond the geographical. It feels a bit like mainland China, a bit like Japan, and in parts like Korea, but in the end it’s definitely the island of Taiwan – officially the Republic of China – where it’s perfectly natural for ‘cheerleaders’ to go berserk to ‘Mickey’ at an ostensibly traditional event and for indigenous performers to strut in canvas loincloths to a techno beat. The festival takes place in the middle of February each year, beginning on the 15th day of the first lunar month on the Chinese calendar to celebrate New Year. Not to be confused with Pingxi Sky Lantern Festival held in a small village east of Taipei, the official Taiwan Lantern Festival is a 10-day bonanza of tradition, lanterns, lights, performances and sensational Taiwanese street food markets. It has been held as a designated event in a different Taiwanese city or county each year since 1990 – a moveable feast, as it were, with 2014’s event taking place in the central county of Nantou, close to the island’s third-largest city, Taichung. Night sky is illuminated by arrangements of light. And so it comes to pass that we arrive at Taipei airport at 4am and are promptly whisked two hours south to our hotel in Taichung. With a few hours to kill before heading to the festival, we gratefully accept the chance to freshen up in our disconcertingly high hotel. I breathe deeply, try not to look out the window and, after a shower and a nap, am ready to take the one-hour trip towards the main festival site. Deposited by a van in a nondescript field, we are ushered aboard a packed bus that takes us to an area where there is clearly something happening. We alight and, as a group of five, work hard to both stick together and go with the human flow in what we presume is the correct direction. 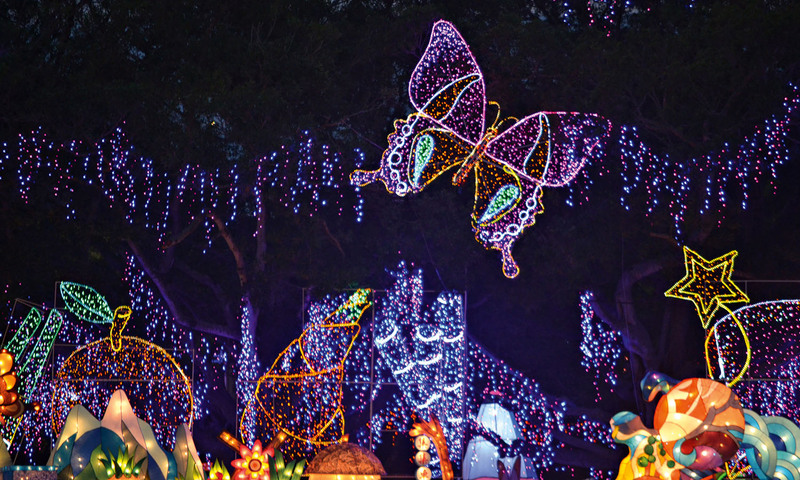 We turn a corner and it’s clear that it is – heading up the hill is a boulevard of lighting display dreams. As far as we can see, the road ahead is festooned with lanterns and lights and bulbs and baubles. There’s little doubt the organisers know their way around a light show and, as we head to the main arena, where the performance is due to start at 6pm, it’s clear they’ve gone all-out in their efforts. 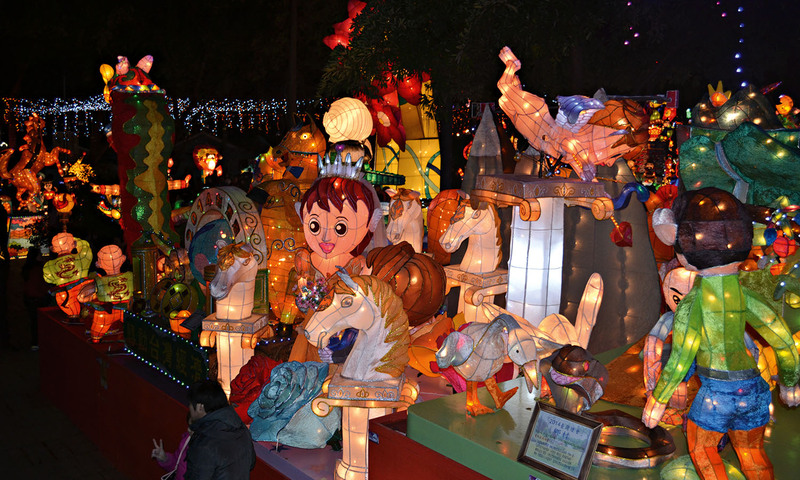 Large zones are designated as lantern displays and the inventiveness, colour and quirky humour on display is a treat. These aren’t lanterns like your grandma hung on the veranda at the holiday house. They’re intricate affairs, depicting everything from traditional scenes to the characters from popular Hollywood movies. We continue onward, but before we get to the arena a detour is necessary. It’s one of the truisms of Taiwanese life that there will always be a street food market somewhere close to any gathering and the Lantern Festival doesn’t disappoint. Off to our left there’s a long lane of stalls offering everything from the sublime – dazzlingly fresh corncobs with sweet melted butter – to the near ridiculous (for my taste buds, anyway). I eschew stinky deep-fried tofu in goose blood for the corncob and some fried potato cakes, the memory of which I’ll find myself salivating over for days afterwards. This huge horse is the centrepiece of opening night. In the distance a massive structure in the shape of a rearing horse draws my eye and it’s explained to me that this is the festival’s pièce de résistance – this, after all, is the Year of the Horse. Some of the indigenous musicians then take to the stage. A dozen muscular men pounding massive timpani-like drums are accompanied by a thumping electronic soundtrack, which one suspects may not be wholly traditional. With the crowd now building to capacity, I take a walk to ground level. Down here, it occurs to me the atmosphere is a bit like a night at the Big Day Out, just with less sweat, more dancers, more lights and a louder sound system. It’s then the opening strains of ‘Mickey’ are blasted out and, as the cheerleaders charge the stage and go bananas, I enter the realm of the surreal. Incense burns nearby, an earnest group of unsmiling youngsters files past holding signs reading ‘No smoking please’, dozens of strobe lights flash, the whole venue shakes to the throbbing beat and the heady aroma of stinky tofu reaches me from somewhere unseen. An alley of fruity delights. It soon becomes apparent all this is leading up to the point when the giant lantern horse, which stands 25 metres high, is illuminated. The word around the venue is that the Vice President of Taiwan, Mr Wu Den-yih, is going to be the person who presses the button on this traditional symbol of good luck and prosperity. Eventually a countdown begins and, sure enough, the VP flicks the switch. The massive horse lights from within, fireworks fire and choreographed lasers and music blast across the now cold and dark sky. Members of the crowd – all 30,000 of them seem to be watching the event via the screen of their mobile phone – cheer in a non-demonstrative Taiwanese way. The horse, which organisers say features state-of-the-art digital triggers, contains 200,000 LED light bulbs and weighs 30 tonnes, is a thrilling sight in the night air, deserving of its place as opening night’s centrepiece. This searing display lasts for around an hour, the crowd transfixed and unmoving. Then, finally, there’s a climactic burst of lights, lasers and fireworks and, literally with a bang, it’s over. People immediately begin to disperse; we’re shivering from what we’re told is a typical Taiwanese cold front that has come through during the course of the evening. It’s definitely time to go, so we wind our way through the throng, our over-stimulated minds abuzz from the show. As we head out of the arena, I spot one of the cheerleaders happily posing for photographs with thrilled punters. I consider telling her that the performance was “oh so fine, oh so fine, it blew my mind”, but I don’t. Instead we happily wander off to find our bus and head back to our hotel after a night immersed in Taiwanese festival life. China Airlines flies to Taipei. Taiwan’s high-speed rail network has revolutionised travel in the country since its inception in 2007. With trains reaching speeds of up to 300 kilometres an hour, they’re a highly efficient way to travel around the populous west coast cities. A wide variety of hotels are available in Taipei and throughout the country. A reasonably priced option is the Dandy Hotel chain, with rooms from around US$115 per night. A more luxurious Taipei option is the centrally located Palais de Chine Hotel, with prices from around US$170 per night.